We are a mercury-free practice. However, many people still have amalgam/metallic fillings in their mouths from years past. These fillings are not particularly pleasing to the eye, and we also know that by unavoidable design, amalgam/metallic fillings may ultimately result in a weaker tooth structure. Porcelain inlays and tooth-colored restorations (onlays) create fillings that are not only beautiful and unnoticeable, but also add strength to weakened teeth. These restorations are aesthetically pleasing because they match the shade(s) of your teeth and they are very strong thanks to new bonding technologies. Since the resin used in tooth-colored restorations contain fluoride this can help prevent decay. The resin wears like natural teeth and does not require placement at the gum line, which is healthier for your gums. The result is a beautiful smile! It is normal to experience some hot, cold, and pressure sensitivity after your appointment. Injection sites may also be sore. Ibuprofen, acetaminophen or aspirin (one tablet every three to four hours as needed for pain) work well to alleviate the tenderness. If pressure sensitivity persists beyond a few days or if the sensitivity to hot or cold increases, contact our office at 203-758-2116. If your bite feels uneven, if you have persistent pain, or if you have any other questions or concerns, please call our office at 203-758-2116. Amalgam/metallic fillings have many drawbacks. They require more drilling to properly shape the tooth so that it will hold the amalgam/metallic filling in place. The edges of the silver filling can wear down, become weak or break. This results in the tooth not being protected and creates an environment where cavities get started once again. With age, the amalgam/metallic filling expands, contracts, and can split. Amalgam fillings can also corrode, leak, and cause stains on your teeth and gums. However, Dr. Smith and Dr. Mandava will never unnecessarily replace amalgam/metallic fillings. He will only recommend it when the tooth has become unserviceable, such as decay or cracking. Be assured that we will always look out for your dental health, but never recommend a procedure or service unless it is deemed necessary. When over half of the tooth’s biting surface is damaged, Dr. Smith and Dr. Mandava may recommend an inlay or onlay. Onlays can provide a very good alternative where damage to the tooth is not extensive enough to merit an entire crown. Traditionally, gold has been the material of choice for inlays and onlays. In recent years, however, porcelain has become increasingly popular due to its strength and color that can match the natural color of your teeth. Inlays and onlays require two appointments to complete the procedure. During the first visit, the filling being replaced or the damaged or decaying area of the tooth is removed, and the tooth is prepared for the inlay or onlay. To ensure proper fit and bite, an impression of the tooth will be taken and sent to a lab for fabrication. You will leave our office with a temporary filling. At the second appointment, the temporary filling is removed. The doctor will then make sure that the inlay or onlay fits correctly. If the fit is satisfactory, the inlay or onlay will be bonded to the tooth with a strong resin and polished to a smooth finish. Traditional fillings can reduce the strength of a natural tooth by up to 50 percent. As an alternative, since inlays and onlays are bonded directly onto the tooth using special high-strength resins, they can actually increase the strength of a tooth by up to 75 percent. As a result, they can last from 10 to 30 years. Porcelain veneers are thin shells of ceramic that bond directly to the front and top surfaces of the teeth. They are an ideal choice for improving your smile and have become increasingly popular due to their simplicity and versatility. 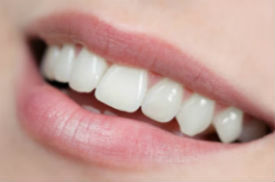 Veneers correct chipped and crooked teeth as well as gaps between teeth. They make slightly misaligned teeth appear straighter and brighten stained teeth. Porcelain veneers are stronger and more color stable than bonding. They also hold their shine while bonding does not. Porcelain veneers will give you a bright natural looking smile that you will love. Dr. Smith and Dr. Mandava will ensure that your veneers are crafted from the highest quality porcelains and are bonded with the most advanced and proven materials available. You will want to take an active role in planning your smile design. We use digital photography and computer imaging extensively to discuss your treatment options. This helps Dr. Smith and Dr. Mandava to review the corrective limitations of providing you with veneers and help you plan your new smile. The second appointment will take one to two hours. Although the porcelain veneer is very thin, many times the teeth are lightly buffed to allow for the added thickness. If this is required approximately one half of a millimeter of tooth is removed. This may require little or no local anesthesia. Then a mold is taken of the teeth and sent to the lab for fabrication. In some cases, a temporary veneer will be placed at this time. The permanent veneer should be ready in approximately 4 weeks. At the time of your third appointment, we will first place the veneer on your teeth with water or glycerin to check the fit and color. At this point, the color of the veneer can still be adjusted by the shade of the cement used to adhere it. Once the color is determined and the veneer is ready to be applied, the tooth is cleaned with specific chemicals to achieve a bond. A special cement is placed between the teeth and the veneer and a visible light beam is used to harden the cement. This appointment takes approximately one to two hours. You may experience some sensitivity to hot and cold after placement of your veneer. This is due to the amount of enamel left on the tooth after preparation. Sensitivity is completely normal and should dissipate in one to two weeks. If sensitivity persists, please call the office. If you are a known clencher (bruxer), please be sure to let us know. We may recommend a nightguard for you to wear to minimize stress placed upon your teeth while you sleep. With proper home care and scheduled visits, they are sure to provide you with a beautiful smile for years to come. Having a beautiful smile is easier than you think. Many people achieve the look they’ve been dreaming of with our simple tooth whitening procedures. Just let us know at any appointment if you would like to begin bleaching. You can lighten only your upper teeth or both the upper and lower, depending on how much of each shows when you talk and smile. Just about anyone can benefit from tooth whitening. However, treatment may not be as effective for some as it is for others. Upon an oral exam, Dr. Smith and Dr. Mandava can determine if you are a candidate for this procedure, including a shade assessment. If you have any visible crowns or tooth colored fillings you may want to consider having them replaced in a lighter shade because they will not lighten during a bleaching process and will stand out against your recently whitened teeth. Research and clinical studies indicate that whitening teeth under the supervision of a dentist and dental hygienist is safe. In fact, many dentists consider whitening the safest cosmetic dental procedure available. As with any tooth whitening product, is not recommended for children under 13 years of age and pregnant or lactating women. If you choose at-home whitening, we will make a custom bleach tray for you which will be ready a day or two after we take an impression of your teeth. 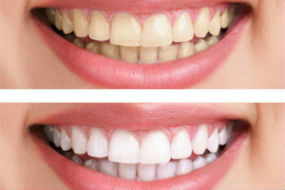 We will then provide you with a special bleaching agent that you put into the clear, nearly invisible trays. With only 30 minutes of wear per day, our special bleaching agent removes stains right out of your enamel without altering tooth structure or existing dental work in any way. We typically advise that you bleach for 10 consecutive days. When your teeth reach the brightness you want, only occasional treatment is needed to maintain your new smile. Dental bleaching can be used to correct many tooth discolorations. These discolorations may have been caused by staining, aging, or chemical damage to teeth. The most common causes include aging and consumption of staining substances such as coffee, tea or tobacco. During tooth formation, consumption of tetracycline, certain antibiotics, or excessive fluoride may also cause tooth discoloration. Using the latest in bleaching technology, we can offer a safe method for creating a beautiful, “brilliant” smile. In cases of extreme tooth discoloration, crowns or veneers may be an excellent alternative. However, because of the low cost of at-home whitening, bleaching is nearly always worth a try. At-Home Whitening – How Is It Done? An impression is taken to make a specialized “mouth guard” or “tray” to hold the bleach against the teeth. You’ll wear the tray and bleaching material once a day for 30 minutes for 10 days, after which significant whitening will occur. In some cases, the change is nothing short of brilliant. For confidence in appearance, bleaching technology offers improvements in yellowing, aging, or stained teeth. For very severely stained teeth, crowns or veneers may be more appropriate. Over-the-counter bleaching agents are available at drug stores and pharmacies. Since these products can potentially harm the gums and teeth, or may not provide you with the desired results, we recommend that you consult with Dr. Smith and D. Mandava prior to their use. An alternative to veneers, bonding can be used as a restorative procedure for teeth that are decayed, chipped, cracked, discolored, or misarranged. Bonding allows Dr. Smith and Dr. Mandava to change the shape of your teeth, or even close spaces between gapped teeth. Bonding can also improve the appearance of stained teeth when tooth whitening is not sufficient or may not be an option for you. Overall, Dr. Smith’s and Dr. Mandava’s bonding technique will enhance the appearance of your front teeth leaving you with a beautiful smile. The tooth is prepared for the procedure by lightly conditioning the surface and applying a bonding liquid. Once the liquid sets, a plastic resin is applied and sculpted into the desired shape. Once set, the resin is trimmed, smoothed, and polished to a natural appearance. The bonding procedure can be completed in a single office visit, and can significantly improve the appearance of a tooth. It can also be easily removed leaving the tooth back in its original condition. Since the plastic resin used is not as strong as your natural tooth enamel, it is more likely to stain, chip, or break than natural teeth. Bonding typically lasts three to five years before repair is needed.